Located in the heart of Crow Country are the Absaraka Cabins. These modern cabins were built in 2002 and feature all amenities. 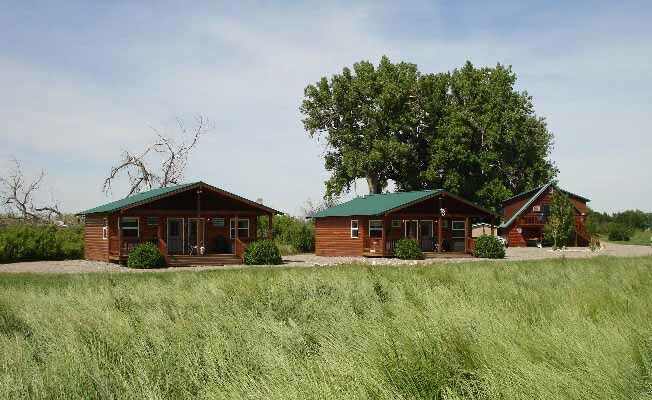 Situated in the heart of the beautiful Bighorn River Valley, the Absaraka Cabins offer quiet solitude and panoramic views of the Bighorn and Pryor mountain ranges and are only three miles north of the town of Fort Smith, Montana. You can have breakfast while watching the pheasants all around the cabins, and in the evenings be lulled to sleep by the coyotes singing in the wetlands beyond the cabins. The Bighorn River is one of the premier fly fishing rivers in North America. Abundant rainbow and brown trout make the Bighorn River what it is... difficult to leave, but always a place to return to. Zoe and Dave Opie, owners and operators of the Absaraka Cabins, welcome you and want you to have a memorable, hassle-free experience. You tailor your trip to fit your needs. Whether you are an independent fisherman wading or with your own boat or looking for a guided float trip, the Absaraka Cabins will provide it and offer a terrific place to call home after a day on the river. Also at bighorncabins.net. Absaraka Fishing Bear Lodge is located 3 miles north of Fort Smith, off the 3-mile fishing access road. At 528 Fishing Bear Road Fort Smith Montana 59035.Absaraka Fishing Bear Lodge is located 3 miles north of Fort Smith, off the 3-mile fishing access road. At 528 Fishing Bear Road Fort Smith Montana 59035.